Liven up your drama classes with something new and exciting! Here is an incredible asset that will put tons of fresh, contemporary material at your fingertips. The text in this software contains dozens of original scripts, lesson plans, and diagrams. 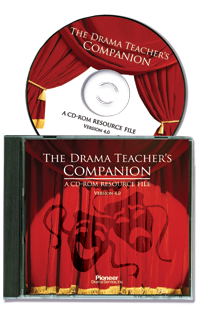 There are over 60 warm-ups and games that are designed for students involved in all levels of drama. You’ll also want to take advantage of over 170 pages of lesson plans for acting, directing, improvisation, and other theatrical subject areas. Freshen up your old handouts with over 150 photographs and diagrams! The more than 45 scripts can even be edited with Microsoft Word to meet your needs. Read more...Whether you have Windows or a Mac, you have all the tools you need to view and print these wonderful resources. It’s a unique and modern way to spice up your drama classroom! The Theatre Machine is a ’hands-on’ text for teaching virtually all of the fundamentals of performance over a relatively brief, challenging and entertaining span of time.